The Lonesome Heroes band will perform a free concert Wednesday, June 23, from 11:45 a.m.-1 p.m. at the University of Wyoming Simpson Plaza. Free food is available for UW students. 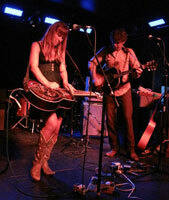 Based in Austin, Texas, the Lonesome Heroes say they perform "psychedelic country music." Founded in 2005 by songwriters Rich Russell and Landry McMean, the band has performed in 27 states, playing more than 150 shows locally and nationally every year. McMeans' lilting voice, meshed with Russell's drier vocals, provide a multilayered nest of acoustic guitar, reverb-laden steel and atmospheric sounds. They have taken country music to a different place by adding a psychedelic-indie edge. Visit http://www.myspace.com/lonesomeheroes for more information.